ASIA/PHILIPPINES - The "Silsilah" movement: "The Abu Dhabi Declaration is a sign of hope for Mindanao"
Zamboanga city (Agenzia Fides) - "We welcome with joy the new document signed in Abu Dhabi by Pope Francis and by Ahmad Al-Tayyib, Grand Imam of Al-Azhar, on human fraternity for world peace and living together. This document is a key element of the Holy Father's apostolic visit to the United Arab Emirates. The text is a sign of hope especially for all those in Mindanao, as in other parts of the world, and who believe in Islamic-Christian dialogue even in the midst of divisions and conflicts": this is what is stated in a note sent to Agenzia Fides by the "Silsilah" dialogue Movement, favorably commenting on the release of the joint declaration of Abu Dhabi. "We are happy – states "Silsilah"- that in this official document the importance of the culture of dialogue as a way to peace is clearly mentioned. We believe that this is the starting point for a deeper understanding of dialogue, supported by love". The note of the Movement continues: "The same spirit is found in the initiative of the United Nations that invites all the peoples of the world, belonging to different religions, nations and cultures to celebrate the World Week of Harmony between the Faiths, in the first week of February every year we reaffirm the path of cowxistence marked by the spirit of love for God, love of neighbor and love for the common good". 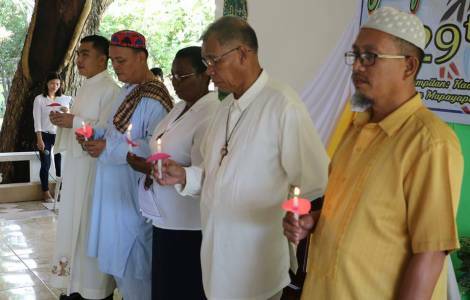 The document of the two great religious leader, notes "Silsilah", was signed on February 4, 2019 during the celebration of the World Week of Harmony between Faiths, which in Mindanao was celebrated with several meetings, prayer, public initiatives. The Movement founded by the PIME missionary Sebastiano D'Ambra recalls, among the relevant points of the document "the adoption of a culture of dialogue as a path, mutual cooperation as a code of conduct, mutual understanding as a method" for interpersonal relationships. And he recalls that "the authentic teaching of religions invites us to remain rooted in the values of peace, to defend the values of mutual understanding, of human fraternity and harmonious coexistence, to restore wisdom, justice and love".